4 brand new songs by Lali Puna + 1 remix by Dave DK (Kompakt, Pampa Records) EP incl. download code. 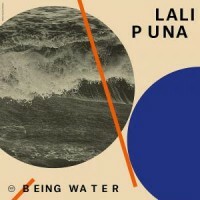 With "Being Water" Lali Puna refine their distinctive take on pop and electronics, pushing the boundaries towards classical songwriting. The four songs - equally affecting and catchy as self-reflected and aloof - are complemented by the airy tripiness of a remix by Dave DK (Kompakt, Pampa Records). Although singer Valerie Trebeljahr wrote "Being Water" mostly by herself, being backed by bandmates Christian Heiß and Christoph Brandner, she rejects the idea of authorship: "Nothing comes out of myself. I'm a sampler: I write music because I listen to music. And I write lyrics because I read". Accordingly, topics and references of "Being Water" vary quite widely: "Who's That Genius" pays tribute to Virginia Woolf and Madonna - and questions why the term 'genius' is still connoted primarily with maleness. The title track refers to the famous Bruce Lee quote "Be formless, shapeless, like water" - but here it is turned upside down: It was Hito Steyerl's video work "Liquidity Inc." that got Valerie's attention, re-reading the quote as a neoliberal paradigm. In contrast, a title like "For Only Love" might sound a little naive as Valerie claims - but: "It surely won't be hate that will save us all". The lyrics were written after watching Obaidah Zytoons and Andreas Dalsgaards documentary "The War Show". "Diversity is queen" - this goes for the music as well. While the dreamy pop of "Who's That Genius" or the catchy guitar loops of "Being Water" are in the same vein of Lali Puna's earlier albums, the free-floating piano chords and tricky rhythm patterns of "Beatx" in some ways mark new territory as Valerie explains: "I am very proud of this song because it is so fiddly. I thought that was something reserved for men".